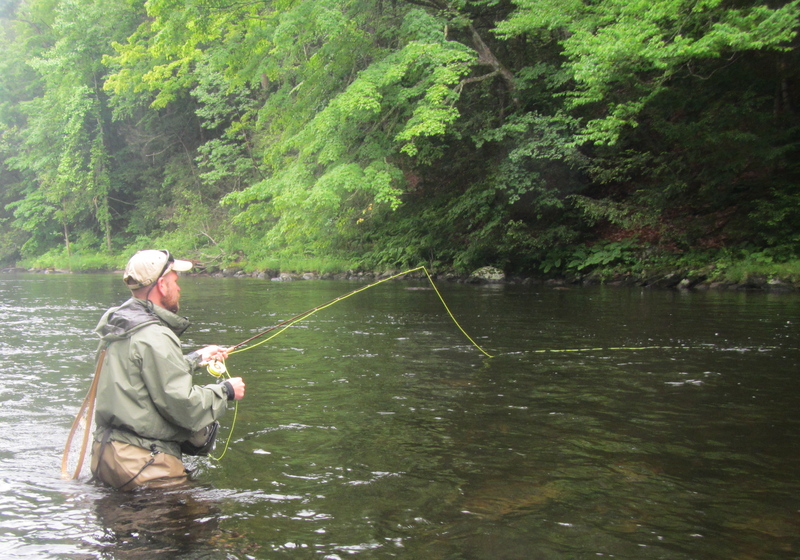 I guided John and his son Mike on the Farmington River for a full day of wet fly fishing. If you live in Connecticut, I don’t need to tell you that it was a dank, rather gloomy day. We had lots of fog and about two hours of a cold rain. 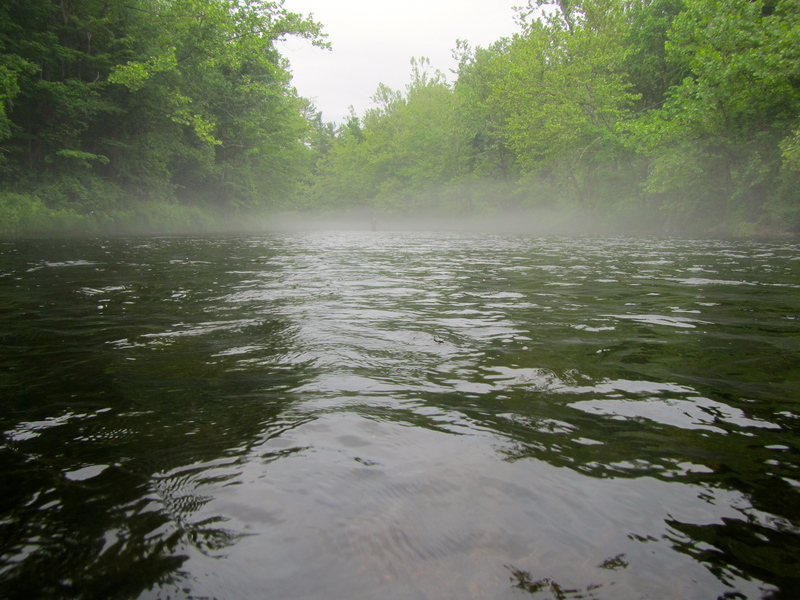 Water in the upper end of the river was running at 360cfs and was 51 degrees. There was just a hint of stain to the water. John materializes out of the mists. No, really. If you look closely you can see him in the center of the river. 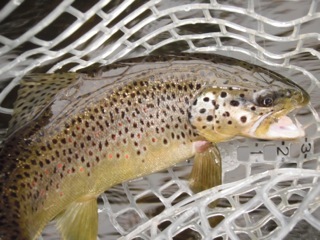 To the fishing: well, it was one of those days where you had to work hard for every trout. We drew a blank at the first spot. The second was a little kinder; we rigged for a deep, short line wet presentation and both father and son hooked up. Downstream a ways, Mike lost a nice fish that hit on the swing. Spot C was unresponsive to our offerings. By now it was early afternoon, and we started to see a few size 16 BWOs (for the most of the morning it was a caddis and midges, though not in any great numbers). Off to the last spot of the day, and that’s when things got interesting. John and Mike had been fighting the good fight for hours with little to show. A little help from Mother Nature, please? Yes. A few more caddis, a building olive hatch, and then some creamy mayflies, about a size 12-14. For the first time all day, we had consistent risers. John netted this stunning brown on a size 16 Partridge and Olive. Well done, sir. Just when the going got good, I had to get going. So much for my brilliant plan to stay after the gig and fish. Not to worry, Father and son carried on quite nicely for a few more hours. Great job today, guys, in some very tough conditions. Mike presenting up and across to a couple fish that were taking emergers along a seam. Sadly, they weren’t taking Mike’s flies. No worries. He knows where they live.